The world’s largest radio telescope is finally complete and ready to explore the infinite depths of our universe and find extraterrestrial civilizations. Christened Five-hundred-meter Aperture Spherical Telescope or FAST, the telescope is situated in Pingtang County, Guizhou Province, China. The construction was completed on July 3, 2016 with the installation of a final triangular panel to the reflector. 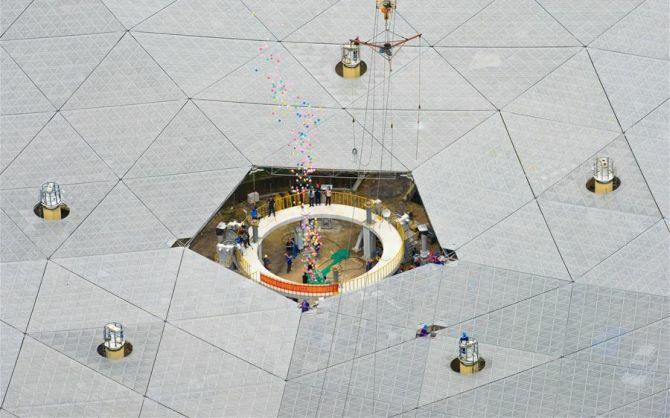 All set to commence operations in September, the world’s largest radio telescope is the size of 30 football fields and is equipped with 4,450 panels. 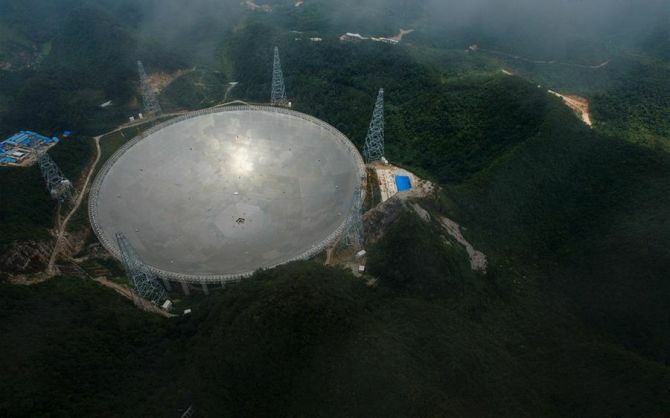 With its completion, scientists are ready to start debugging and trial observation of the $180m (£135m) FAST telescope. The initial idea to set up FAST in Guizhou was proposed by Chinese scientists more than two decades ago. With a huge round depression surrounded by green hills, the site surveying started in 1994 where geo-morphological features, karst topography, climate, radio interference and environment were checked. The place was home to 12 families consisting of 65 people called Green Water Village. All these locals were shifted to towns in 2009 where they are now enjoying a better life. 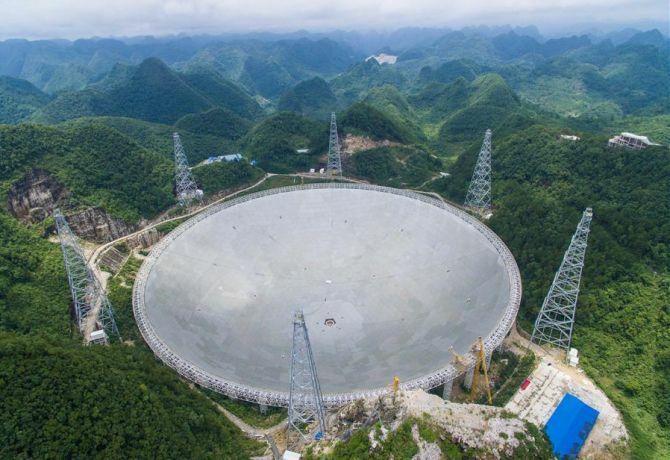 As the depression is surrounded by three hills, there is ample support for the huge Five-hundred-meter Aperture Spherical Telescope to sit comfortably. Also, the karst landscape known for its underground drainage systems with sinkholes and caves is good for protection of the reflector. Besides that, as there are no towns within a 5-km radius of the site, the place is perfect for radio silence. Once the FAST telescope is up and working, it will allow scientists to survey neutral hydrogen in distant galaxies and detect faint pulsars. Also, it will improve the chances of detecting low frequency gravitational waves. Well, the most appealing and interesting thing is that it will help us find extraterrestrial life. 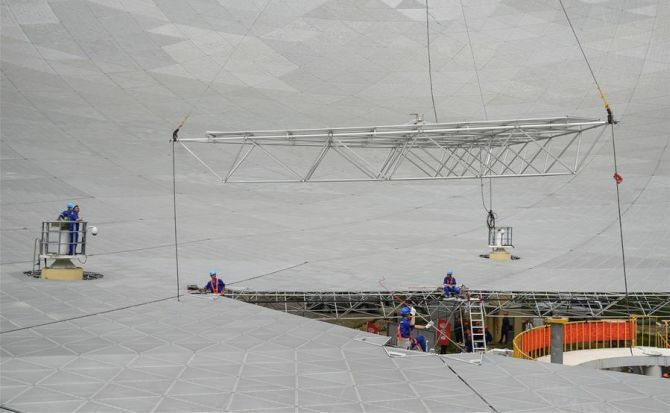 FAST has taken the title of world’s largest radio telescope from Arecibo Observatory in Puerto Rico which is around 300m in diameter.